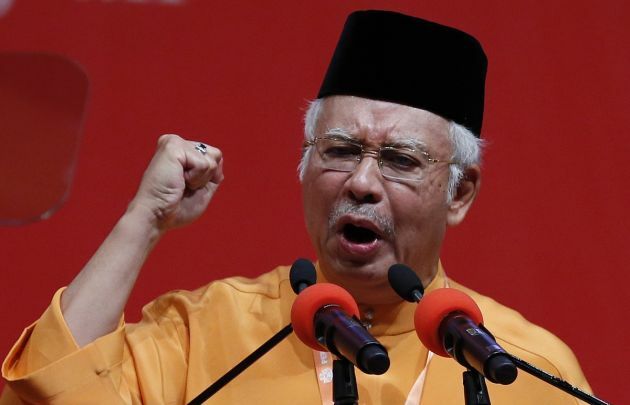 (Photo: REUTERS / Olivia Harris)Malaysia's Prime Minister Najib Razak gives the keynote address during the United Malays National Organisation (UMNO) annual assembly at the Putra World Trade Centre in Kuala Lumpur November 27, 2014. Razak on Thursday bolstered a law protecting the sanctity of Islam and the country's traditional rulers, the sultans, in an about-turn to scrap a law banning criticism of the government. The Malaysian leader told a meeting of his ruling UMNO party that the act would be maintained and strengthened. Malaysia's education minister has downplayed accusations that a college in Sabah forced Christian students there to wear Muslim headgear and pray under a tree. Education minister II Datuk Seri Idris Jusoh on December 1 lambasted a newspaper report which accused the college of preventing the students gathering their prayer groups on the campus, the Malaysian Insider reported. "Only small issues are being highlighted, and if these are said to be representative of Malaysia as a whole, it is not right," Idris said at a press conference. He pointed out that instead of promoting discord among faiths in Malaysia by publishing "provocative" reports, the media should advocate harmony of people of different religious affiliations. Idris was reacting to a report in the Sabah newspaper, the Daily Express, which claimed that some Christian students at Labuan Matriculation College suffered religious harassment from school authorities. In its November 29 report, the Express said it received information that school authorities prevented Christian students from assembling into their prayer groups at campus. Instead, they were made to pray outside the buildings under a tree. The accusations were that the Christian students were also made to wear Muslim headscarves - tudung for girls and songkok for boys - as a prerequisite for them to participate in the school's student government assembly. This isn't the first time the college has been embroiled in religious controversy. In July 2012, school officials were said to have pressured Christian students to convert to another faith. At least three students reportedly converted, though an investigation into the incident neither established nor disproved the allegation. Catholic bishops in Sabah protested against the purported conversions, asking the government to look into the reports to uncover the truth behind the allegations. The education ministry and the diocese met in December 2012, but the outcome of the meeting was never publicized.